From across the atrium, the sound of wheels rolling across linoleum tiles can be heard over the teenagers’ chatter. Pushing her bright blue walker and trying to get through the clusters of high schoolers walks Mira Desai ‘22, on her way to her Biology class. 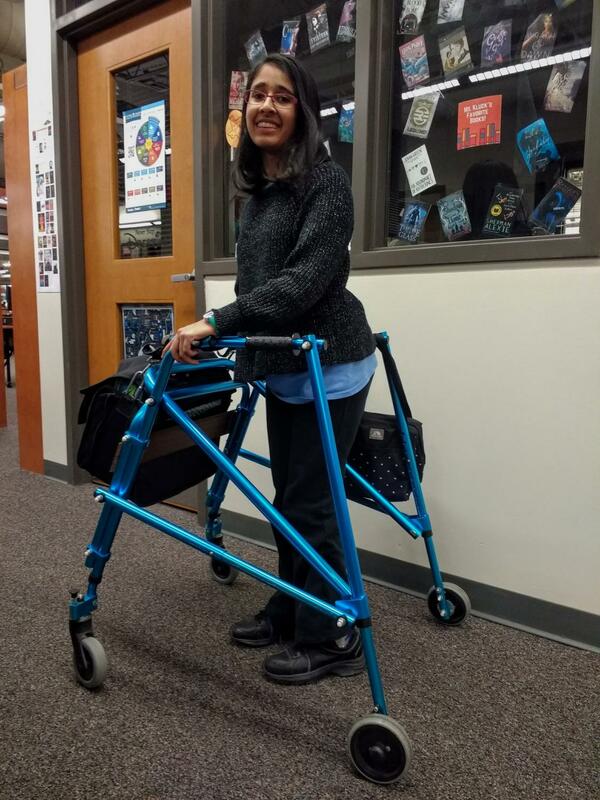 Desai has cerebral palsy, a condition which affects motor skills and as a result necessitates the use of a walker. She goes to physical and occupational therapy twice a week to help strengthen her core and her walk, and to help her be able to live on her own one day. Despite having a condition that limits her movement, Desai leads a fairly normal life. She loves to read and sing. Her dad drops her off at school in the morning, she takes the elevator to get to science and her other classes on the second floor, heads to the cafeteria to have lunch with her friends, goes back to class, and then goes home to do school work. The same schedule as hundreds of other students. Desai even manages to find a bright side to having cerebral palsy. She’s also really close with both of her therapists. Desai has known them since she was three years old, and as a result, she says that her therapy sessions aren’t ever awkward. “We know a lot about each other so we’re able to ask each other questions about random things that are going on in our lives,” Desai said. Of course, there have been negative impacts that cerebral palsy has had on her life. One of the biggest downsides that comes from regularly using a walker she says, are the stares. Although most of the time people just stare, similar incidents have happened here at school as well. Regardless of the unfavorable effects of cerebral palsy, Desai tries not to let it impact her too much. Wonderful story! So inspiring! She seems so sweet! Keep up the amazing work!